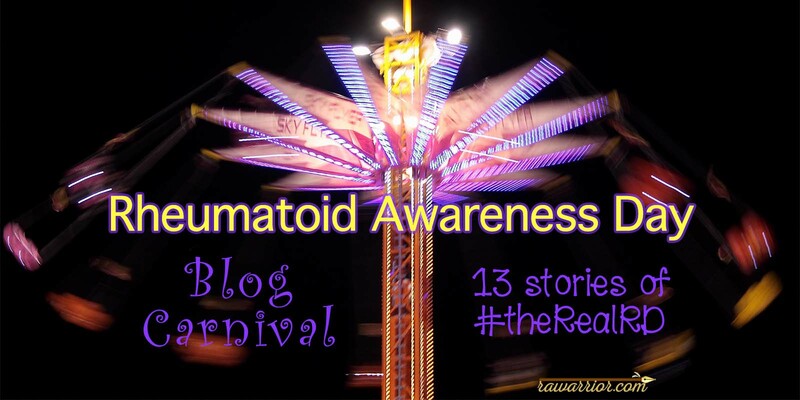 This Rheumatoid Awareness Day Blog Carnival is in coordination with the Rheumatoid Awareness Day Blog Challenge by the Rheumatoid Patient Foundation. Many websites and blogs participated in RAD and published about #theRealRD facts. If you’ve published a post for RAD that’s not included here, you can leave your link in a comment. Which one of the 7 #TheRealRD facts might make a difference to you if the world understood it? Which ones do people have difficulty grasping? Thinking back, was there ever a time you misunderstood some of them? 1) Rheumatoid disease is not a type of arthritis; arthritis is just one symptom. 2) Current treatments are not adequate for many people with moderate to severe rheumatoid disease. 3) Rheumatoid disease manifests itself differently in each person and even in the same person over time. 4) RD research is severely underfunded in the U.S. at about 1/12 per patient rate of similar diseases. 5) Rheumatoid disease is often an invisible illness. 6) Early aggressive disease treatment has been shown to produce the best outcomes. 7) Remission is rare. Daily pain is not. 1) In honor of Rheumatoid Awareness Day, Amber at Journey to the Knot posted On the Other Side of Disease, which focused on Fact #7. Amber counts her blessings, not only her third baby on the way, but also remission from rheumatoid disease. She writes movingly about what life was like before remission: “terrified that the prison of a body I was caged in…” If nothing else makes people understand the need for increased research on RA / RD, this should. As she raises her little ones, this young mother deserves to be able live her life not imprisoned in a cage or fearing it, and so do the rest of us. 2) For her spirited Rheumatoid Awareness Day blog post, Mischelle at Facets of Living with RA posted Rheumatoid Disease Awareness Day, focusing on Facts 3 and 4. Mischelle writes about what awareness really means and whether it’s possible to really know another’s suffering. She uses effective analogies like this one: “I thought if one more person compares a disease that has leveled my life to rubble to their pinky ‘killing’ them I might just be fitted for a orange jumpsuit. One is imprisoned by their own body…” Mischelle affirms she’s decided that if she has to be an RD survivor, she wants to be one who’s surviving with hope. 3) In honor of Rheumatoid Awareness Day, Elizabeth at Handicap Accommodations posted Rheumatoid Disease Is Different For Each Person, focusing on Fact #3. 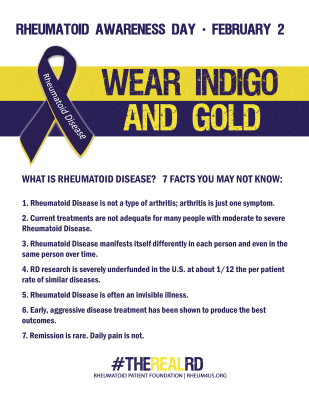 4) For her creative Rheumatoid Awareness Day blog post, Annette at Here’s Your Gold Watch – Rheutired posted The Real Rheumatoid Disease: You Mean It’s Permanent? focusing on Facts 1 and 3. 5) For his heartfelt Rheumatoid Awareness Day blog post, Vince at Epistle for Joy & Hope posted Invisible Pain – Invisible Illness, focusing on Fact #5. 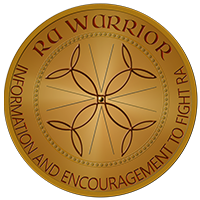 Vince writes about his long journey with RA / RD since age 10. He says people have often been unaware of his battle with “the invisible pain of flares, fevers and fatigue.” As a person determined to be “carefree and compassionate,” Vince says he rarely felt the way he looked on the outside. His solution is one that will make my family smile as I’ve muttered it out loud hundreds of times: If only pain could have a color… then people could see how much someone is suffering. 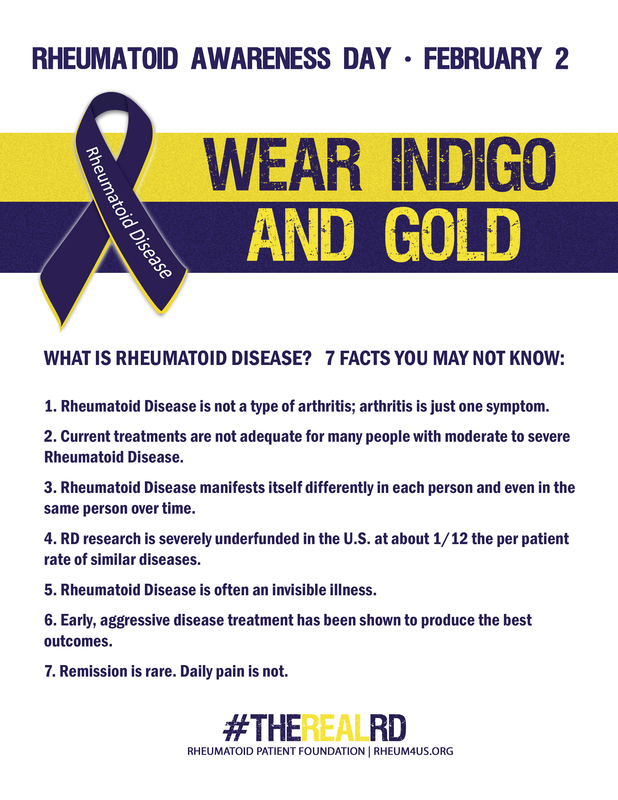 6) In her frank Rheumatoid Awareness Day post, Dana at The Water’s Edge posted 4th Annual Rheumatoid Awareness Day: The Real RD, focusing on Fact #1. 7) In a passionate Rheumatoid Awareness Day blog post, Lene at the Seated View posted The Best Way to Achieve Rheumatoid Arthritis Remission and Barriers to Its Use, focusing on aggressive treatment strategies as Fact #6. Lene traces the historical progress of treating RA / RS from the old pyramid approach to the modern treat to target method. She considers reasons many people with rheumatoid disease are not treated with the most current / aggressive approach. Lene responds to these issues by highlighting the value of lives lived productively by people whose disease is treated successfully. 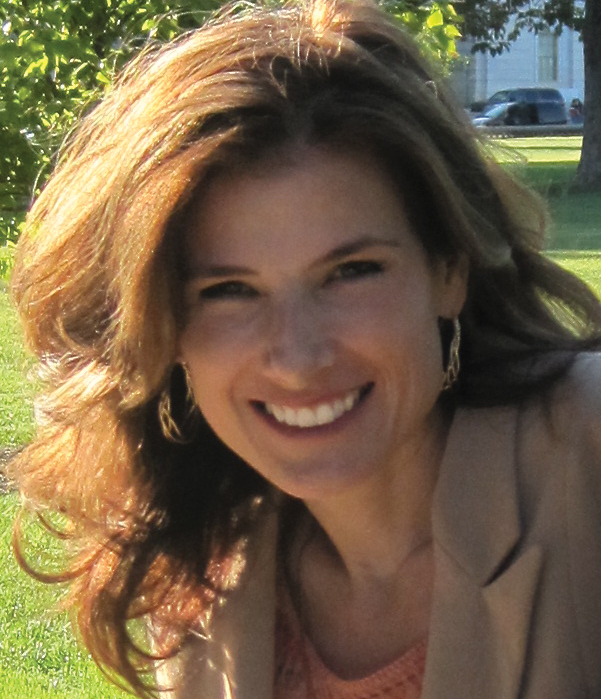 Lene strongly advocates for progress in attitudes toward treating rheumatoid disease. 8) For her Rheumatoid Awareness Day blog post Lisa at Lisa’s Yarns posted RHEUMATOID AWARENESS DAY, focusing on the early treatment window illustrated in Fact #6. Lisa describes her diagnosis story, and how difficult it was at first to know that it was RA /RD. Family members who suspected RA / RD urged her to go back to the doctor until she had answers. Lisa shares that she now realizes how little she knew about RA / RD. She makes a good case for greater awareness to take advantage of a window of opportunity for better response to treatment, which fortunately was effective for her. 9) In her Rheumatoid Awareness Day blog post, Judith at United Advocacy Australia posted Rheumatoid Awareness Day Blog Challenge Fact #5 – Rheumatoid Disease is often an Invisible Illness. #THEREALRD, focusing on Facts 5 and 1. Judith shows reasons rheumatoid disease is often an invisible illness. She posts a long list of common RA / RD problems, many of which are not joint related. Judith says “Rheumatoid Disease is MORE THAN ARTHRITIS” and asks people who don’t have the disease to not assume people with RD are well because their symptoms are not obvious. 10) For her Rheumatoid Awareness Day blog post, Veronique at Chronic Illness Blog posted Rheumatoid Awareness Day: What Causes RA / RD? Links, and Stories of Recovery, focusing especially on Facts 1 and 3. She points out the systemic nature of rheumatoid disease and that joint inflammation is not always the first symptom of RA / RD. Veronique also points out the variety of experiences with the disease, including in it’s onset. She discusses the possible role of trauma as a trigger for the disease. 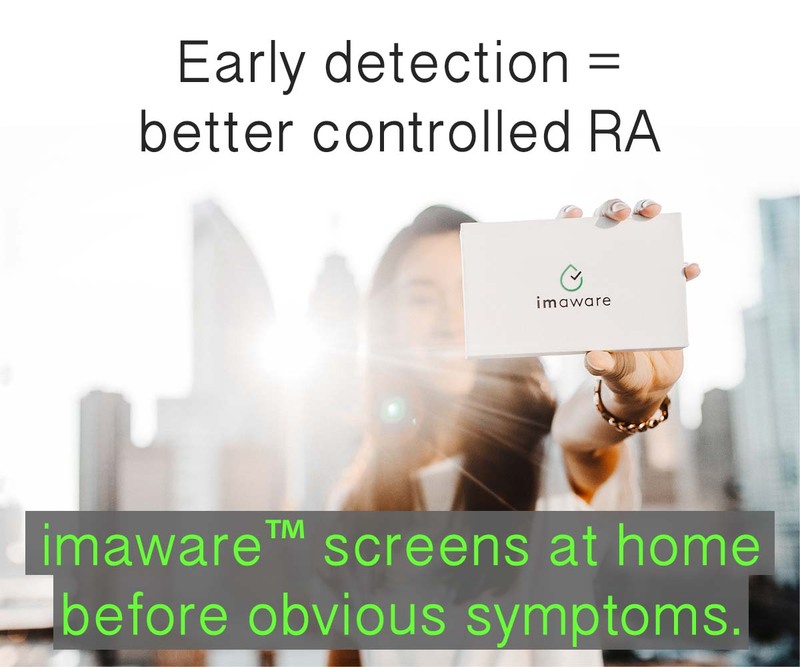 11) In his Rheumatoid Awareness Day blog post, Andrew at Living with Rheumatoid Arthritis posted Rheumatoid Disease Awareness Day – Feb 2 focusing on Fact #2. Sadly, as Andrew points out, many people with rheumatoid disease do not respond to treatments currently available, over a third in fact. Andrew is awaiting the beginning of treatment number 12, with a rheumatologist dedicated to finding something that will help him. 12) In her Rheumatoid Awareness Day blog post, Martha at Martha Spong posted I confess: Glenn Frey, a cough, RA, and me, which focused on Facts 1 and 5. Martha relates the story of her own chest infection to the story of Glenn Frey’s death. She explains what many don’t know about living with a chronic illness like RA /RD, and how they commonly respond when we try to explain it: uninterested. She writes about the deep feelings resulting from the invisibility of a serious illness that’s not what it’s assumed to be. 13) In her Rheumatoid Awareness Day blog, Saundra at Blog RA Junction posted Rheumatoid Awareness Day: Help Share RA Information, focusing mostly on Fact #1. Saundra points out that RAD is in February, heart disease awareness month. She explains why rheumatoid disease is different from “arthritis” (aka osteoarthritis), but a systemic disease related to immune function. She lists effects of the disease on the body beyond the joints such as anemia, fever, and fatigue. This was a tough blog post for me to write. Reading these experiences all in one day, some in remission and some still hoping to find relief, gives a good overview of life with rheumatoid disease. And it properly underscores facts of the #theRealRD. I’ve never singled out one entry before but I want to ask you to be sure to check out Martha’s blog post if you’ve ever struggled with anger in response to RD. 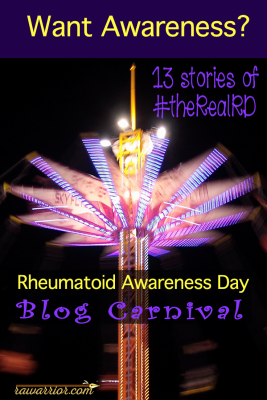 Martha wrote this blog before she knew I was holding a carnival for Rheumatoid Awareness Day blogs. I’m pretty sure you’ll agree I had to include it. I’m not like Martha. I’ve never responded to treatments as she has. But I’ve walked through many similar experiences and her post tugged at my heart. Not being able to open a doorknob …or worrying when you can’t cook homemade meals for your family …having your brave child face it by your side …keeping it all to yourself because even the people who love you can’t handle the truth. Doesn’t it help to know you aren’t alone? I hope you’ll bookmark this page and make time to read all the entries this week. Hi Kelly – I so understand how difficult it would have been to read through all of our posts and to feel and recognize so much of the pain and the truth about those of us on similar journeys. My own chronic illness is chronic fatigue and yet I can relate to so many of these RA/RD facts – from the invisibility, to the lack of treatment, to the lack of response to treatments that work so well for some including the things we can do on our own such as juicing and major (major!) dietary changes, to the irregularity of symptoms and how they are different for all of us and for me from one day to the next. Thanks for all that you do. And thx for linking to my post, I feel really honored to participate in your education and awareness raising! Thanks for doing this. Our rheumatoid disease is so complex and affects each of us differently that I sometimes wonder why it is still considered one disease. Your summary of the blogs certainly makes the complexity of rheumatoid disease obvious. My name is Sue. I relate to every post here. The worst is daily pain, mess that once worked stopped working leaving me on a redicul us high strength of pain medicine just to get out of bed to do something. I am embarrassed on these paid Ned’s and don’t want others to know. Reason maybe because I don’t have a friend or relative ( except 1) that understands why I can do much house cleaning, going places… Resulting in no help from those you thought were your friends. But I understand too, that they can’t see it, they don’t know how much pain I’m in! I’ve even lost friends and relatives. That adds depression to everything else! Doctors have seemed to have given up. I was a registered nurse and the doctor that over prescribed me prednisone causing me brittle bones with a bone density of -3.3 change his medical records!! So going to a new RA Physician asks for old records don’t get truth! Is there really any help? I believe not! Sorry this was not a positive post! Truthfully, the only times I can feel no pain, anxiety, depression and feel my best if if I smoke a few puffs of marijuana at night. Something I can’t afford! Living with a invisible disease has been the hardest thing in my life! Leah please allow me conversations with these women I need help. Hi. I’m Pradyumna from India a developing country. I have fought a ridiculous war with pain and poverty since I made my debut on the earth. I had faced the unforgettable disease the Rheumatoid Arthritis when I was perhaps 3 years old. The disease diluted my childhood with acute joint pain. I get a neak name dukha( the sadest one). It pined my heart and sure it’d continue through out my life. It was aggravated from the toe to knee till I reached 18. yes i had bedridden for 10 months at the age of 10. Every year I had similar problems and I had unexpected tour to hospital. But the real challenge entered with all the fate when I was 18. Being a very optimistic guy, I have tried my best to make myself fit. I tried for Indian Naval service. Though I had cleared physical and written competition, could not succeed. I had an accident and both my wrists injured. I suppressed the fact before my family for few months. I went to orthopaedic doctors for that, but they started treatment for RA. But the Irony is they prescribed pain killers those used in cancer. When I came to know from a medical store, I had severe psychological disorder at my degree exam. And eventually the aggravation of disease increased to all small joints when I was preparing for a government job. At last crossing all the huddles I get a job with a new stage of disease frozen soldiers along with all previous symptoms I had. Now I am at the age of 33years old. But no better than an old man of nineties. The abovementioned story is my real story. Yet I am happy with courage that If I get a good physician, I’d be fit and marry a beautiful lady. And have dance with her in all marriage parties of the juniors of my childhood friends. I had developed severe knee pain and tenderness in knees at the age of 32. The specialist doctor told me after few tests that I had rheumatoid arthritis and that I would have to take medicines for life. I was in tears. Thankfully my homeopathic family doctor told me I am perfectly fit and fine. We again did the tests and reports were normal. 1 ) First step to any medical problem: TRUST AND POSITIVE THINKING. Keep saying to yourself you are perfectly fine and that you WILL RECOVER. and everything falls into place. 2) Believe in yourself more than any doctor who scares you. Believe that there is a solution for every problem. 3) Our body has its own natural healing techniques and sometimes we only complicate things by going for unnecessary tests and medicines. 4) Try a foot soak. It can work wonders! Soak your feet in warm water mixed with a cup of epsom salt. epsom salt has the ability to flush toxins. 5) Eat lot of calcium-richfood. Eggs, spinach, bananas, sesame seeds , drumsticks, etc. 6) Go out in the morning sun and take a nice sun bath for minimum twenty minutes daily. This is especially for housewives who generally miss the morning sun..That ensures proper Vitamin D levels..
7) Last but not the least PRAY AND STAY HAPPY. Illnesses are caused only by wrong thinking and vitamin deficiencies . Take care of both these aspects and you shall be fit and fine. Nothing is better than your own inner calming spiritual talks. Try yoga or meditation for that purpose or a daily ten minutes positive affirmation prayer. This is applicable to any disease in the world.